The dark days of December seem even darker with no snow cover on the ground and day after day of cloudy skies. I went out to the garden in search of blooms for Garden Bloggers’ Bloom Day and found mostly the ghosts of summer past. There are some dried up seed heads from hydrangeas, sedums, and coneflowers and a row of zinnias that I havn’t pulled out yet. Several trees still have seed pods hanging from them, reminding us that months ago in a memory called spring, these were blooming, too. Now you can see why in December, many of us focus more on what we have blooming indoors, and often go out of our way to have indoor blooms. In my sunroom, I have a few blooms. My white flowering Christmas cactus, Schlumbergera sp., started to bloom a few days ago, on the same schedule as last year. The Bouvardia I bought before Thanksgiving likewise has a few white blooms left on it. I also planted Narcissus and Amaryllis bulbs which have all sprouted but none are blooming yet. To add more color inside, even when plants aren't blooming, I'm branching out in my plant choices by acquiring some colorful plants like these newly sprouted Oxalis. And by January, the colorful jewel orchids, which I highlighted in a post a few days ago, should be blooming as well. What’s blooming in your garden or house? I would love to go on a virtual tour of your garden on this dreary December day, either indoors or outdoors, and see flowers blooming somewhere! It’s easy to participate in Garden Bloggers’ Bloom Day. Just post about what is blooming in your garden today, then leave a link on the Mr Linky widget below, along with a comment, so we can find you and come for a visit to see! Alas, Carol, it's not pretty in the outdoor garden here. A good snow cover almost melted away with this weekend's warm temps and rain. And, as I write, the temperature is supposed to start dipping to 5 degrees/-15C overnight! But we did manage to find some color for GBBD. Thanks as always for hosting. Our garden is desperately lacking snow - don't know whether we'll be getting any at all. The few blooms I've got, are mainly from indoors. You took the words right out of my mouth: ghosts. 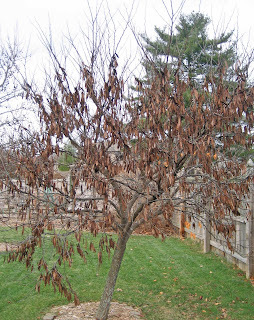 Have you ever been able to do anything with all those seeds from the Judas Tree? Mine never seem to sprout. Outside all is gloomy and dark, so in honour of December Bloom Day I've created a bit of a white-out here with ghosts from the past. Thank you Carol, for taking out time from your Xmas schedule to organize our monthly GBBD party. I looked at your April post too and it's lovely. I especially like the pictures with the pansy blossoms -- beautiful! Surprisingly December's very much like November, in spite of all our frosts lately. Have a good Blooms Day! Thank you again for hosting bloom day. I want to wish you Happy Holidays and a prosperous New Year. (BTW, do you like the smell of paperwhites? I am in the like column). Yes, it's the time for us in the northern hemisphere to look forward to next season! Your Christmas cactus looks lovely. Season's greetings and hope for a more colourful January! Hi Carol, thanks so much for this meme, it is the favorite of so many. I have done a full year now, and it will be fun to go back and see if the same things are featured each month as they were the year before. I see a couple already from last December's post, one of my first ones. Those little oxalis are great and can go outside for more color splashes next spring? I forgot to add, that Mister Linky is a brilliant way to handle all these links! It makes it so much easier to visit everyone. Great job, Carol! I have my post up for Bloom Day but with a slight change ... I had to add another letter to make it GBNBD. Hi, Carol. There are still a few blooms in my garden, even after the snow. Thanks for hosting GBBD. Hi, Carol--Your ghosts are lovely, as are your houseplants. I LOVE paperwhites, have them in my post. And your oxalis are so pretty. By the way, you might let readers know that if they use Mr. Linky for another posting (like Skywatch), they need to make sure the url in the link box is for their Bloom Day posting and not an older one. Hope that made sense. Happy Holidays! Hi Carol, I was able to show a few lingering blooms in my garden this month. Your Christmas Cactus is lovely. It's nice to have indoor blooms at this time of the year. Thanks for hosting this fun forum! I like your poor dried hydrangea. I messed up this summer by cutting mine off to dry, and it didn't bloom again. It was a smaller pink kind. I'd only tried them once before, and it didn't bloom the first year, then died over the winter. It was a supposedly native kind. Anyway, I turned my computer off when I went to bed, so my post didn't get published at midnight like I hoped it would. It's up now, and there is a tour of my whole mostly brown yard in the previous post. The oxalis looks pretty cool! Unfortunately there isn't much blooming here now. The African violets just finished a burst of blooms and I'll have to wait for more. I did a "retrospective piece" for Bloom Day though! Happy December Bloom Day, Carol. Earlier this month on December 10 while in the garden I came across a most unusual sight : My forsythia had produced one lovely lonely yellow bloom, a last hurrah before winter . I've got my post up for today. I'm glad that despite no blooms outside, I have a few inside to tide me over! Thanks for hosting Bloom Day -- I was EARLY this month -- a first! One day soon I'm going to be able to have some indoor plants. Much nicer to look at than piles of snow outside the windows. I went outside and nearly turned into a mangled popsicle before I was done. LOL. 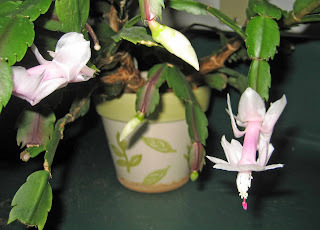 Do you keep that white Christmas cactus in your sunroom? Is it cooler there than the rest of the house? I find it interesting that it blooms with no special treatment. 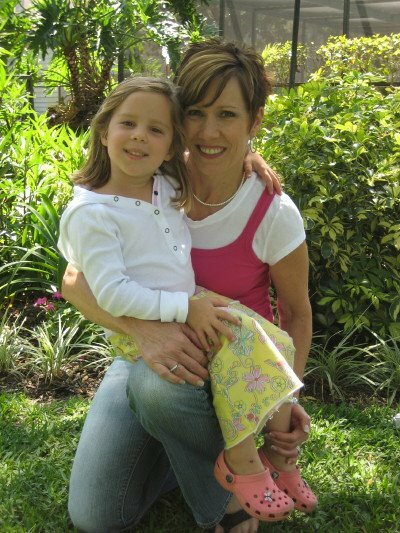 Hi Carol, I'm new to GBBD, thanks for hosting! I'm lucky enough to have some things blooming still. Mmmm...what a great color on that oxalis foliage. Who needs flowers? Though you do have some pretties, too. Not much in bloom here in PA, but I did find one - yay! And the new link feature is super, Carol. Thanks for hosting Garden Blogger's Bloom Day:-) I only have some indoor blooms this month, but those are a lifesaver during the winter. Thanks for coming up with the idea for Bloom Day. It's the only way I'm going to see anything in bloom this month. I have decided to order some of those Oxalis this spring. I fell in love with them in Austin, then forgot about them until you mentioned potting some up. It's been quite hectic lately. Yesterday we celebrated my dad's 80th birthday and it was quite a party. No outdoor blooms at MDG I see but inside you have some to keep your inner gardener happy. My bloom post is finally up too. Happy GBBD! Hello Carol and fellow Bloom day Bloggers! What fun to read about the vagaries of gardening throughout the different zones - indoors and out! 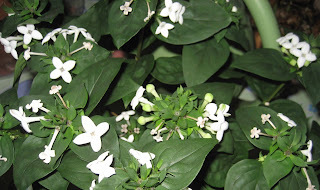 While my garden is under a "Seattle snowfall" - that's a light dusting to the rest of you hardy souls - my indoor garden is sweetly scented with a Sambac Jasmine (which I've kept alive and blooming for - count 'em - 9 MONTHS!) My paperwhites are another story. Apparently I've inadvertently cultivated the very rare, choice WEEPING variety. How disappointing to bring them along to this point only to have them splay ridiculously all over the tabletop!!! Oh well, winter is almost here...then spring! Carol, this is my second go at leaving a comment. I dont know why whenever I leave a comment on your blog - it gets gobble up by the something! 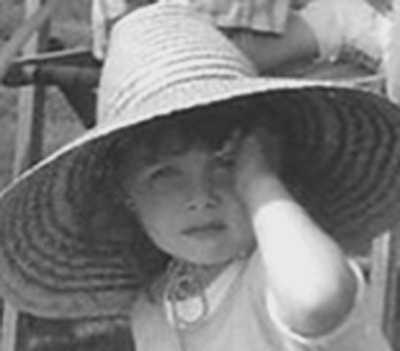 I love the words that you used, "ghosts of summer" - very evocative. My Garden does not even seem to have those - but I have pulled something together for GBBD. I think Mr. Linky is great! Suddenly I'm very aware that I have no blooming house plants. I've missed an opportunity to have flowers through the winter and I love christmas cactus and amaryllis. I always plan my bulbs for late winter bloom and fill the house with cut greens for Christmas. 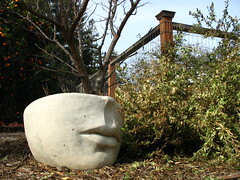 The good fortune of the professional gardener is December pruning. Next year I'll think of flowers for Christmas. I love it when Oxalis can be a plant not a weed. Otherwise, the word "oxalis" just gives me the shudders. The solstice is just six days away! It's -28 C and here I am participating in my first bloom day :) This looks like a lot of fun - I wonder why I waited so long to jump in? Not so many blooms in my new garden, but there are a few. Come on over for a visit, Carol. 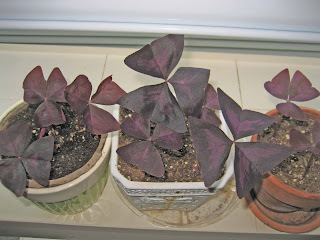 I enjoyed seeing the purple oxalis in your indoor garden. It's one of my favorite shade plants here in Austin, where it is ever-purple. Carol, we are actually cold here in Austin as well! Thank you for hosting GBBD, as always. Hi Carol,my Bloom's day post is up too. We have the Bouvardia bloom in common. I didn't mention in my blog that I have pentas, pineapple sage and begonias in bloom in my little greenhouse, just things I found outside. Definitley no blooms outside but more inside than I have shown due to some glitch. I hope I figure it out because I am also going to post aboout our big ice storm - cascades of crystal scattering rainbows across the dazzling ground. I wish it was as easy to capture that in a photo as to string a few words together. I like the links! I'm going to have to do some serious blog reading tonight and tomorrow. I have a few blooms outside still, and none inside. With a cat and 2 dogs... I don't put plants inside. The rain stopped early enough to take photos...there are lots of wet plants here in Davis. And I am not complaining...all rain is welcome here. I second Dee's comment! Thanks for inviting me to your gathering! I was able to look at a few GBBD posts on my break at work, and Mr. Linky was working fine, but now that I'm home and ready to dig in, I'm not seeing the links. Has anyone else had this problem? I'll have to open another window and click on people's names on their comments. Your indoor blooms are lovely, Carol. I always enjoy being a part of this party! Mr. LInky is back now. Yea! Another great blog, Carol. 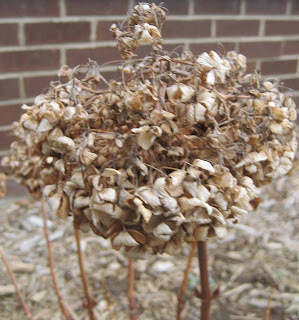 I'm sure it makes you a little sad to see what were once beautiful blooms dried up on the stalks in the yard. I'm sure those blooms indoors will keep you happy til spring. I hope you get a chance to check out my blog. Thanks, Carol, for keeping this going! finally got all the pictures downloaded, uploaded, inputted, and written on.. YAY! Thanks for hosting this Carol, makes me feel warm and gooey inside. Off to pour boiling water over the surface of the water buckets so the Song Dogs won't get thirsty. Wishing you all the best for 2009! So glad to have found everyone here. My gardens have long lost blooms but fortunately things are blooming inside. This gets me through the long winter. Thank you for hosting this celebration! That dark room of yours make a perfect gardening all year round! Even though I do not need one,as for my country it can be too hot and need to partial shade most of my plants. Hello and happy Bloom Day, Carol. Kathy Purdy urged me to "play," and so here I am. I feel like we are seesawing back and forth between winter and fall, with no idea what the next day will bring. If this doesn't confuse all the plants, I don't know what will! Oooh. Mr. Linky is very cool. It was tough taking photos today as the weather has turned cold and nasty (by Austin standards). it was windy and there wasn't much light for good closeups. But I decided to try to snap a photo of every flower blooming...not every type but every single one. It always seems like a lot but they are teeny tiny singular flowers in a large yard of mostly dry brown. Carol, Even though I only posted one almost blooming bloom and a blooming challenge, please count me in. Love the "ghosts of summer past" by the way. So appropriate for a Christmas "Carol"! Thanks always for hosting. I'm with Crafty Gardener, having a GBnBD. But I found some interesting things to photograph even if they're not flowers. Carol, I almost didn't make the deadline today! It is so cold here that I didn't want to even venture outside; of course, nothing is blooming out there. Your Christmas cactus is lovely; it's been awhile since I had one, and I had forgotten how pretty they were. It's been a while since I've managed to get a Bloom Day post in! I'm glad to have one finally. It is so cold, I almost didn't venture out to find a bloom, but I did. Thanks again for hosting Carol. This is always fun. It's nice you have a sun room to grow some indoor blooms, Carol. I just love the color of that oxalis. Will you put it in the ground in the spring? I've been very tempted to purchase my first ever Christmas cactus they have been so pretty in the nurseries. Yours has got a lot of blooms on it. Thanks for hosting GBBD---even in the dreary days of winter you still have the gardener's touch! Hi I just happen to stumble upon your blog tonight! I wish I would have seen it earlier, I would love to have joined you guys. I live in So California and my garden still has so much color. I love gardening all year long! Carol, I managed to find a few blooms on this snowy December Bloom Day. Your Christas cactus is pretty with the touch of pink. I have those ghosts in my garden too, and took a picture, but for some reason didn't post it. Our ghosts of summer past are covered in snow here. The Bouvardia is new to me. It's pretty. I've been wanting to grow some Oxalis. I love that deep shade of purple. My post is late, but it exists and there are flowers. That's enough sometimes, isn't it Carol? Hi Carol, I just love that oxalis! I'm overwintering them in the basement for the second year. Maybe you'll even get some blooms from them this winter. Thanks as always for hosting Bloom Day. Love the new Mister Linky feature! Hi Carol, this is my first time to participate in bloom day. I posted late last night. Thanks for hosting such a fine forum for flower happy gardeners. Hi Carol! I was only 1 day late this time...yay me! LOVE your white Christmas cactus. I need to get myself a bouqet of flowers for next month's Bloom Day...things are mighty sparse around here. Hi Carol - I'm back to my late self this month. Nothing blooming outside, but I do have some inside ones! Thanks for hosting again! I wish I had some nice indoor plants blooming as you do. But I managed to find a couple bloomers outside. Thanks for letting us know about Mister Linky and also for hosting such a great forum! Better late than never, as the saying goes. I'm dealing with lots of snow, but thank goodness, my amarylis came thru. I'm skipping Bloom Day this month as I was out-of-town for a funeral. Though I wanted to stop by and say that I really like the new link format and that my outdoors blooms are few - mostly pansies - but indoors things are heating up with super-fertilized violets coming on and paperwhites bursting open. Have a great rest of your 2009! What a fun post! I am a little late to the game, but I have posted my first Garden Bloggers' Bloom Day post. Thanks for hosting! 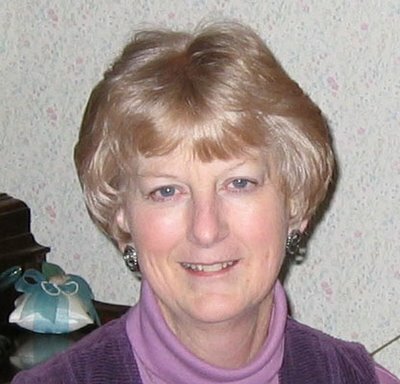 Carol, your garden might be bare, but your blog is blooming. I love your observation of how dark December is without snow. Great Link widget! Thanks for hosting GBBD. Our ice storm in Maine was as beautifully bright as it was deadly, and now 3-5 inches of snow is in our forecast for today. You won’t find any blooms, but it is so gorgeous here. Happy Holidays to you and all you garden bloggers! Thank you to everyone who joined in for bloom day. I think I've visited everyone who left a link on Mister Linkey and left a comment. If I missed you, it was unintentional, let me know! Hey, let's do this again in January! I hope you don't mind if I join at this late date. I have enjoyed perusing many of the posts listed and wanted to contribute what few blooms I have at this time! Thanks! Whew, that snowstorm really put a dent in my GBBD post! But I'm finally up. I've moved my gardening posts to a new blog, too, so I can focus on gardening. I hope you'll come visit!